UPDATE: This post originally said that the analysis in the linked report came from the Tax Policy Center. That was an error on my part. It’s actually a report from the chairman’s staff of the Joint Economic Committee, which relied in part on a previous analysis from TPC. I’ve corrected the post throughout. Apologies to all, especially TPC, for the mistaken attribution. 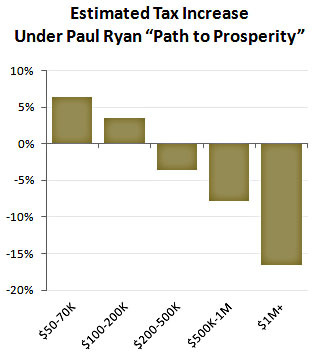 The Joint Economic Committee released an analysis today of the tax implications of Paul Ryan’s “Path to Prosperity,” based partly on work from the Tax Policy Center, and you will be unsurprised at their conclusions. The chart on the right, a rough conversion from JEC’s raw numbers into percentages, tells the tale: if you’re part of the middle class, your taxes will probably go up. If you’re rich, your taxes will go way, way down. Ryan and his fans will say that this analysis is unfair because they’ve never released any details about which tax expenditures they plan to eliminate to make up for their reductions in the base tax rate. And it’s true: they haven’t. But that’s pure politics: they know perfectly well that eliminating deductions and tax credits is wildly unpopular, and if they actually fessed up to these details, even the most ardent tea partier would suddenly become a pitchfork-wielding foe of Ryan’s plan. Still, Ryan’s reduction in tax rates costs about $4.5 trillion over ten years, and there are only so many places you can make up that kind of dough. So JEC made some educated guesses about what deductions would have to be cut, and then gamed out the net effect of the whole thing. If Ryan had the courage to release his own plan, it would differ in detail from the JEC estimate, but probably not by a lot. The JEC numbers are almost certainly in the right ballpark. In any case, if Ryan thinks this is unfair, all he has to do is release a plan of his own that can be scored in the normal way. The fact that he consistently refuses to do so tells you all you need to know about how serious he really is about this stuff. Answer: not at all.